Airport scavenger hunt with for flights with kids including a free printable! Guys, I have the most fantastic new idea for you for flying with the kids! I’ve created an airport scavenger hunt that you can print off and take on your next trip! Read ahead for more info! I can count on one hand the number of airports in the world that I actually like spending time at – for the most part, I find airports stressful and chaotic and I spend the whole time there looking at my watch to make sure we don’t miss the plane. Traveling with kids has not enhanced my airport experience one bit, and trying to keep my little ones occupied in an airport is pretty high up on my list of things I dread before a flight (especially if there are flight delays – read more on how to survive flight delays with kids here!) It’s hard to keep a balance between keeping them busy without going through all of the entertainment you have planned for the plane, and wearing them out walking around while giving them something to do. On our next trip this summer, we have a long layover in Iceland (read more about our trip with IcelandAir and our amazing 24 hours in Reykjavik!) and I’ve been wracking my brain for ways to keep my 4-year old occupied at the airport while still being able to walk around to wear my toddler out. It finally hit me during a trip to the mall a week ago; my son had been getting bored trailing around after me, and I decided to keep him busy by asking him to look out for things for me. I told him to look for things like a person wearing something pink, or someone wearing sunglasses. This kept him occupied while I was able to shop, and he was actually disappointed when we left! Kids scavenger hunts are such a perfect way to keep kids occupied, and it occurred to me that this game would work just as well in an airport, a place where there is so much to look at. With that in mind, I’ve created an airport scavenger hunt for use on our next trip. It has things that I know will be easy for him to spot, like planes and a pilot, as well as trickier things we’ll have to walk around a little to find. My plan is to print this chart off and laminate it, then travel with a dry erase marker so he can check things off as he goes, and then reuse the list at the next airport we visit. If you think this is something your kids would love on your next trip, I’ve made it really easy to download this free airport scavenger hunt printable for you to use! Either click on the link here or on the picture below to download your own airport scavenger hunt! 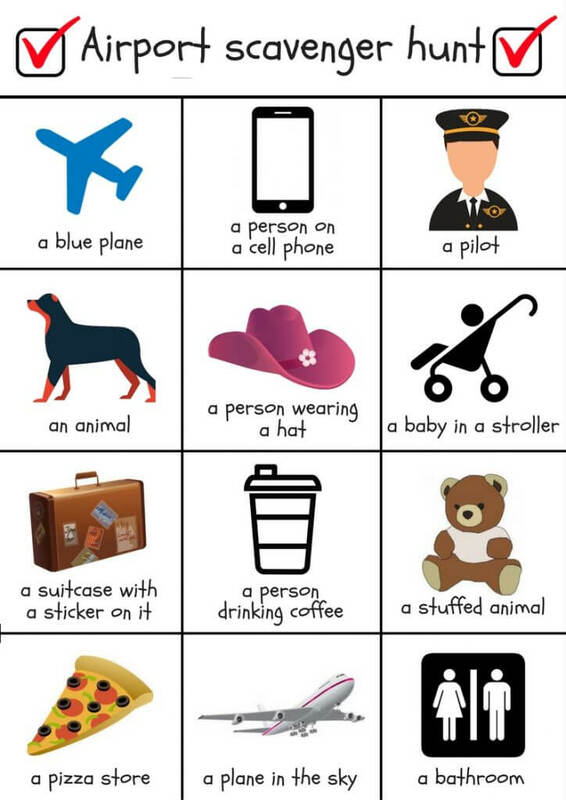 Kids scavenger hunts are fantastic tools to keep little ones entertained, and I hope this airport scavenger hunt keeps your little one busy at the airport too! Hope you enjoy this airport scavenger hunt! Let me know if you use it in the comments! This is so awesome, my kids love these! As soon as they hear they are going on a plane, this is literally the first thing they ask for! I love them because they take up so little room in a carry on bag, and it’s amazing how effective they are at keeping the kids occupied! just printed for our Cali flight! That’s so exciting! I hope your kids had fun, and I hope the flight went well! Enjoy your Cali trip!